It isn’t long before their fiery arguments flare into scorching passion. 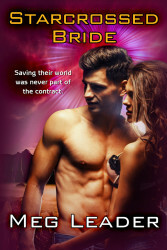 But when they come across a deadly alien menace on their travels, their love will face the ultimate test. Are they strong enough to save themselves–and the entire human colony? A delightful and complex mix of comedy and fantasy—a sensual love story set in a sensational world. I hope for more from this talented author.